I stumbled upon this children’s book in my library, and eagerly took it home, since I loved Steig’s other book for young readers called Dominic. I was not disappointed in this at all. 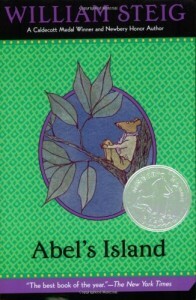 A small little book about a mouse that gets stranded on an island due to a storm, and has to develop his own survival skills. It’s a very touching story about becoming interested in the bigger questions of life – who am I? what is home? what makes life meaningful? And yet, it does this in a very child-friendly way. One of the lovely things about Steig’s writing is that he doesn’t dumb it down at all. His language and vocabulary is always elevated, providing a wonderful way to help children expand their own language. I see this children’s book and his others as great read-alouds for young children. I can’t quite decide the age for independent readers on this. Perhaps third and fourth grade would be able to read and understand it. One of the nicest features of a children’s book like this is that we really get to leave the busy world behind. In this case, the little mouse was like a Thoreau, living in utter simplicity. And as he did, we, along with him, get to ask, what is really necessary to make a life? Food, Shelter, Water. And then, how to deal with loneliness. All in all, a thoughtful and lovable piece of writing, with a spattering of delightful Steig illustrations.